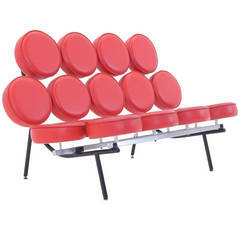 Marshmallow Sofa / Loveseat in Red leather by George Nelson for Herman Miller. 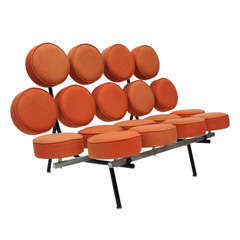 Early marshmallow sofa model 5670 designed by George Nelson for Herman Miller, circa 1956. This is an early excellent (One of the best) examples of an Iconic Classic modern design. Acquired directly from the private collection of the original owner. Sofa is in excellent untouched original condition with original Naugahyde, original 'Domes of Silence' levelors, enamel, chrome-plated steel and the original receipt. 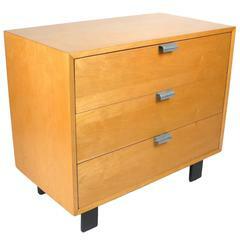 3 Drawer Chest by George Nelson for Herman Miller. Very good condition. 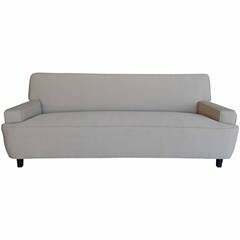 George Nelson Marshmallow sofa, model 5670 Manufactured by Herman Miller A great example of an iconic form. 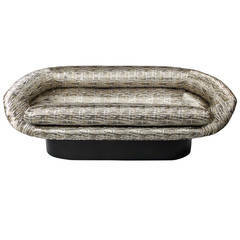 A museum worthy example of this iconic sofa. Labelled on underside. 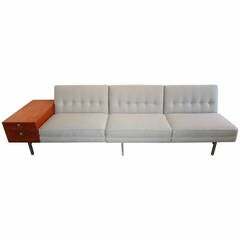 Modern George Nelson for Herman Miller sofa with a side table for their Modular Group line.